Washington D.C., 1912. Illustrating something from the Boy Scout training manual or possibly the 842nd verse of the Kama Sutra. Either way, heavily influenced by Indian lore. Harris & Ewing glass negative. View full size. Submitted by Harvey in Fla on Mon, 01/14/2013 - 3:24pm. I wonder how many waterproof ducks it took to make one pair of these leggings. Submitted by Tobacconist on Mon, 01/14/2013 - 3:14am. This picture is the followup to one posted a few years ago. Leggings: (Puttees). The style of leggings is the same as United States Army puttee legging. Made of best waterproof army duck. Price 55 cents. They were actually copies of the Army's M1907 Leggings and should not be confused with the wool strip leg wraps of the World War I era, which were also known as puttees. They were designed to be worn over the lacings of the uniform breeches (page 360 - Price $1.00). A better view from a previous Shorpy post can be found here. Stockings (page 366 - Price 30 cents in cotton, $1.25 in wool) could also be used with breeches, but didn't look as neat, as seen here. Submitted by marion10 on Sat, 01/12/2013 - 8:18pm. I believe the scouts are wearing gaiters. Submitted by Peter on Sat, 01/12/2013 - 1:01pm. What are those strap-on leggings the boys are wearing? Submitted by Stevil on Sat, 01/12/2013 - 11:01am. Transformation [which is the actual state of existence] is to be ascertained as removed from birth and destruction, devoid of existence and non-existence, released from qualified and qualifying. Submitted by Bridesmill on Sat, 01/12/2013 - 9:53am. Submitted by Jimmy Longshanks on Sat, 01/12/2013 - 4:14am. Be certain to thoroughly check each passenger for banned items. Submitted by Rhys on Sat, 01/12/2013 - 2:58am. This picture demonstrates a form of artificial respiration that might revive someone who had drowned. 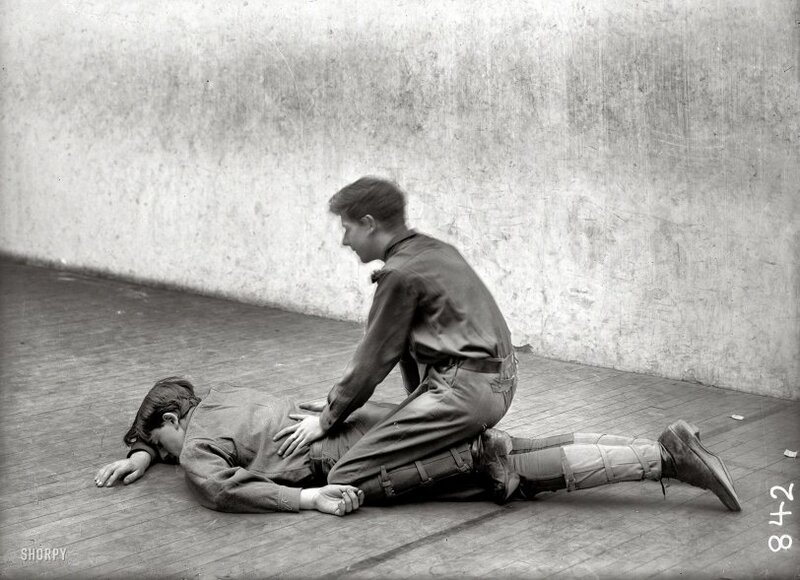 The body of the boy underneath is in the approved "recovery position," while the boy on top is applying rhythmic pressure to the lungs. Mouth to mouth resuscitation is supposed to work better. Submitted by Chinawanderer on Sat, 01/12/2013 - 2:51am. It looks like a demonstration of an old, and not very effective, way of dealing with a drowning victim. The idea was to push up on a person's back to force water out of the lungs. It also involved manipulating the arms to expand the lungs between pushes.